Synopsis: There is 12 hours left before humanity is wiped out forever, and James is helping Rose find her family. In most end-of-the-world films, we follow characters as they try to stop the inevitable (such as ARMAGEDDON) or let the inevitable happen and everyone is gone in the blink of an eye (MELANCHOLIA). In THESE FINAL HOURS, a meteor has hit Earth in the Northern Atlantic, and a fireball is slowing engulfing the rest of the world over the next 12 hours. The science doesn't exactly make sense, but that's a minor point in the film. Ten minutes after the meteor has hit Earth, James is in bed with his lover, Zoe, and after a disagreement of sorts, he decides to leave and be with his girlfriend Vicki. The world has been thrown into mass chaos. There are people killing others in broad daylight, murder-suicides are rampant as people don't want to be engulfed in a ball of flames, and there are orgies around every corner. As James makes his way to the "party to end all parties" thrown by Vicki's brother James, he comes across two men who have kidnapped a young girl, Rose. James saves Rose, who wants to be reunited with her family. 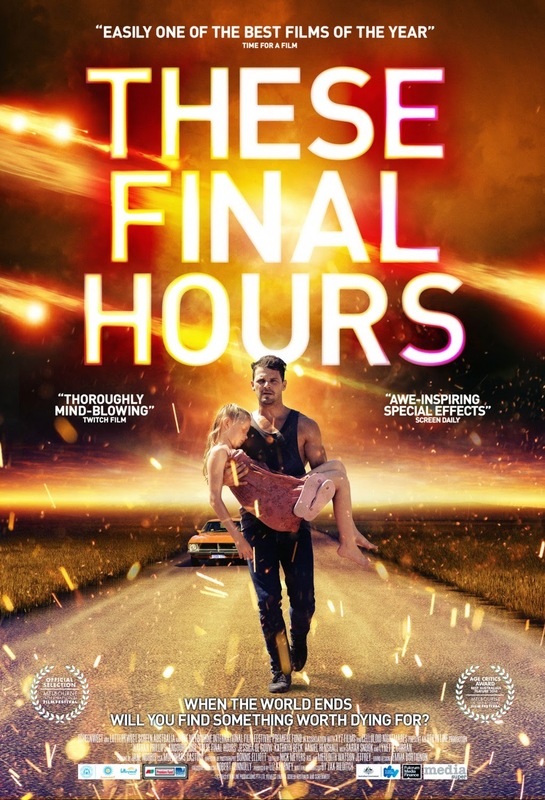 The film is quite bleak in its portrayal of the end of the world. There's not a lot of information given to the audience about any events leading up to the meteor hitting, but there are tidbits thrown in to give us an idea of what's happening. We're thrown into the chaos, and the true nature of humanity is shown. In typical apocalyptic fashion, most of humanity turns evil and almost nihilistic. It's almost as if people are going out of their way to raise hell and break laws. This depiction of evil feels a bit cliche. I'm sure people would run a muck if the end of the world was near, but I can't imagine everyone would just go on a killing or robbing spree. The message of the film is a bit confusing. On the one hand, it comments on how evil people become when they learn there's only 12 hours left to live, yet there's one glimmer of hope with James. But he seems to be the only decent human around. So, are we to assume the majority of humanity would just break every rule and throw their morals out the window? It's a tough pill to swallow because that is making a big assumption about peoples' choices. The part of the film which worked was the relationship between James and Rose. James initially doesn't want Rose to tag-along, but when he tries to drop her off at his sister's place, he finds a grim scene and realizes he might be her only chance to make it back to her family. Rose, played by Rice, is fantastic. She's younger, around 10 or 11, but has a quiet maturity. She is in this awful situation, but doesn't freak out like most would at her age, or like some adults in the film did when facing the inevitable fate of death. Philips as James is also great as a guy trying to be strong and do the right thing amidst the chaos. He could have easily been portrayed as a one-dimensional hero, but instead he shows real emotion while coming to grips with reality. This is not a film that will bring a smile to your face. It's gritty and hard to stomach at certain points. Though the depiction of how humanity turns evil in the wake of death feels a little old and wearisome, the acting of the two leads makes the movie worth watching. You'll just need something light and happy to watch afterwards.